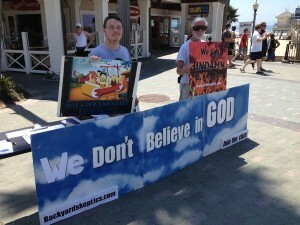 This was our second trip to the HB Pier this year, and our annual Bible-tearing event. Well, we don’t actually tear Bible, we tear the worst verses which have been either photocopied or type up on paper with their verses and chapters clearly visible. The object to to show Christians (who BTW are usually shocked that these verses are in their holey book) that 1. they haven’t read their Bible and 2. that they take morality and moral decision-making into their own hands when deciding if verses like these, which would normally place anyone in jail if acted upon, are worth abiding by. Here’s where the main point of the Bible-tearing comes to light. If the Christian decide not to take these immoral verses seriously, they can toss out the entire book, because if these verses are unholy, all verses come into question. Christians, unlike God’s commandments of keeping the entire book sacred, pick and choose their own morality from only the verses that suit the lifestyle that they are in. 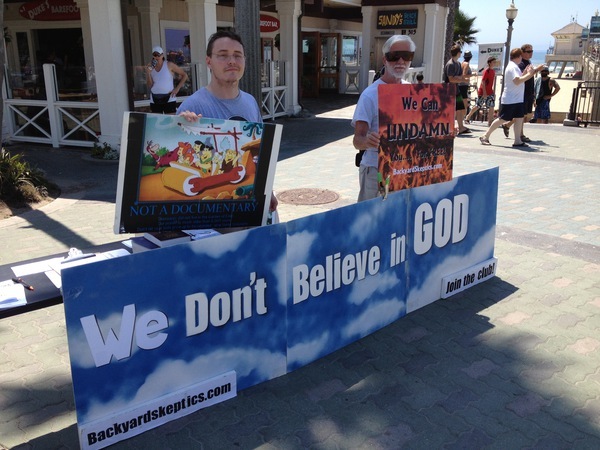 They might say – “That was then” and I’m glad they do this, because it point to another contradiction that God was wrong! If the Bible would have said “This verse will be good until society of each country in the world has a better law, and at the time this verse should no longer be obeyed” then Christians could say “that was then”. When push comes to shove, Christians have to admit that they are “Cafeteria Christians” and only select those laws they they agree with. And if they take morality into their own hands, why consider a bronzed-aged text to to they bidding?